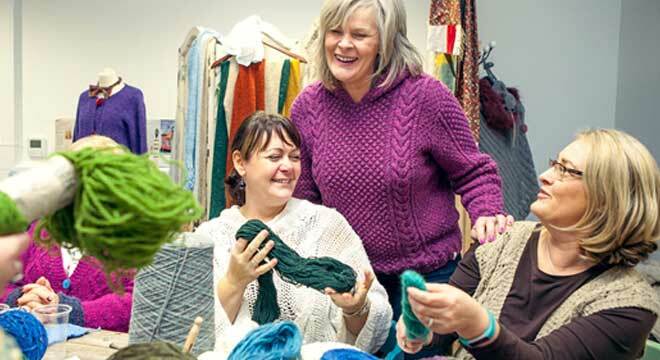 Begin your knitting tour of Ireland in Dublin where you will enjoy a panoramic tour of the city and visit the Constant Knitter to meet a local craftsperson for a short demonstration and informal chat. On your second day in Dublin you will meet Lisa Sisk for a knitting workshop following the Moebius Knitting technique. Spend some time on Inis Mor which is the largest of the three Aran Islands. Here you will meet Aran Knitting enthusiast, Una McDonagh for a workshop and tour. Continue to Mayo via the Museum of Country Life, you will then meet Ciara Ní Reachtnín for another workshop. The Northern part of your tour includes Studio Donegal, a hand-weaving and clothing manufacturing business, the amazing Slieve League Cliffs, Glencolmcille Folk Village and a workshop with Irish Designer Edel MacBride. The next day discover Ireland’s famous Causeway Coast, visiting the Giant’s Causeway and Dunluce Castle. See Belfast City and visit the famous Titanic Belfast and visit Mourne Alpacas outside the city. Before you return to Dublin for your final overnight visit Aine Dunne’s studio for a spinning and tapestry workshop and pay a visit to Thomas Ferguson Linen Factory for a guided tour. This morning meet Lisa from ‘This is Knit’ for a workshop which includes an informative talk on the developments in the Irish Hand Knitting scene over the past ten years as well as a two hour ‘Moebius Knitting’ workshop following the ‘Glenties Cowl’ pattern, designed by Lisa Sisk. For this class you will be using Soft Donegal yarn from the mills of Studio Donegal in Kilcar. After your workshop we continue with our panoramic tour of Dublin and will stop at Dublin’s Guinness Storehouse for a guided tour. Located in the heart of the iconic St. James's Gate Brewery in Dublin, this production site has been home to the Guinness Brewery since 1759, when Arthur Guinness signed a 9000 year lease! This evening dinner is not included so that you can sample one of Dublin’s many restaurants and bars at your leisure. Overnight in Dublin, Bed & Breakfast included. Day 3: Travel to Aran Islands & Tullamore D.E.W. After a leisurely breakfast, board your touring coach and travel to Tullamore D.E.W. Heritage Centre where you will discover how Daniel E. Williams went from stable boy to distillery manager to creating the whiskey which still bears his initials today. There will be time for some lunch before continuing to Rossaveal in County Galway for your ferry to Inis Mór (Also spelled Inishmore), the largest of the three Aran Islands. On arrival, meet with Aran Island locals for an introduction to Aran life with special attention to history of Dun Aonghasa in preparation for your visit the next day. Dinner will be served at the hotel accompanied by your hosts and after, enjoy a quick traditional Irish dancing lesson or if your tired feet are not up to the task, you can watch the instructor display some simple steps! Overnight on Inis Mor (Inishmore), Dinner, Bed & Breakfast included. Day 4: Another Day & Night on Inis Mór! This morning, enjoy a Knitting Workshop where you will learn traditional methods and stitches the Aran Island way. Then it’s off for a tour of Inis Mór with your local guide. The island has more than 50 different monuments of Christian and pre Christian history and you will pay a visit to the impressive fort of Dún Aonghasa. The fort consists of three terraced walls surrounding an inner enclosure containing a platform on the edge of a three hundred foot high cliff. Please note that the walk to the fort is up a sharp incline and suitable footwear should be worn and is not recommended for those who may have walking difficulties. The views from it are breathtakingly spectacular. On your tour you will also visit some of the local knitwear shops that are on the island and enjoy a delicious lunch at Teach Nan Phaidi! Overnight on Inis Mor (Inishmore), Dinner, Bed & Breakfast included. Begin your day with the early ferry back to the mainland. From there travel through Connemara to the Museum of Country Life. After lunch (included), enjoy a knitting workshop with Ciara Ní Reachtnín. During your time with Ciara you will learn how to make the Deirdre na nDólás (Deirdre of Sorrows) Shawl pattern, one of Ciara's own Celtic Mythology Designs. Techniques taught in this class will include constructing the garter tab, adding beads to your knitting, the unique cables and lace design of the main body of the shawl and attaching the beaded lace edge. Finally travel the short distance to Sligo where you will check into your hotel. Overnight in Sligo, Dinner, Bed & Breakfast included. Leaving Sligo we journey to Donegal on Ireland’s Northwest Coast. First visit Studio Donegal, a hand-weaving and clothing manufacturing business committed to preserving and promoting traditional Irish hand-weaving. Here you will see the process of hand-weaving from start to finish including the spinning, warping and weaving of the wool. Next it’s on to Slieve League Cliffs, one of the highest cliffs in Europe to enjoy some amazing views. After lunch (included) at the cliffs we will travel the short distance to Glencolmcille, an area famous for its wealth of traditional Irish culture, music and prehistoric settlements. Take a tour of Glencolmcille Folk Village, a collection of several small cottages, called a ‘clachan’, resting on a hillside that overlooks the stunning Glen Bay Beach. Designed, constructed and conserved by local people, the Folk Village is one of Ireland's longest running living-history museums. Overnight in Donegal, Dinner, Bed & Breakfast Included. Today meet one of Ireland’s finest knitwear designers, Edel MacBride, for an intensive Aran knitting workshop. Enjoy a core workshop including yarn pack, working the best of Irish moss, cable and Edel’s favourite Aran stitches. After your class and some lunch we take an optional trip to the nearby Donegal Craft Village where time will be allowed for you to peruse the craft shops at your leisure or have a coffee at the cafe. Of particular interest to you may be the Weaving and Felting studios. Return to Donegal where the afternoon is free for your personal sightseeing or shopping in Donegal town. Donegal has lots of nice craft shops and Magee Tweed is well worth a visit or you may like to visit Donegal Castle which was built by the O'Donnell chieftain in the 15th century. Overnight in Donegal, Bed & Breakfast Included.